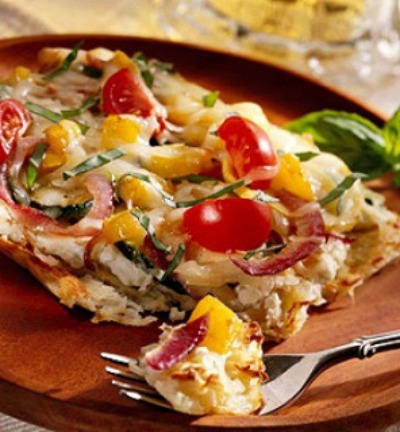 Vegetable pizza with potato crust is a wonderfully light meal, not to mention the delightful. This vegetarian pizza is a great meal and you can be creative with the vegetable choices. It is a great way to use the fresh produce from your garden or from your local Farmer’s Market. Imagine, a pizza crust made from potatoes and the delightful smells coming from your kitchen while it bakes! Prepare Potato Crust; set aside. In a large bowl, combine zucchini, summer squash, yellow pepper, red pepper, onion, garlic, jalapeno pepper, and 1 tablespoon olive oil. In a large frying pan or wok over medium-high heat, heat the remaining 1 tablespoon of olive oil. Saute the vegetables mixture until they are crisp tender, stirring often. Remove pan from heat. Spread goat cheese over baked potato crust; top with cooked vegetables and quartered cherry tomatoes. Sprinkle with basil and mozzarella cheese. Bake approximately 5 to 7 minutes or until cheese is melted. Remove from heat and serve immediately. Preheat oven to 425 degrees F. Butter a 15x10-inch baking dish or pan. Place raw potatoes in a colander. Salt potatoes and let set for 10 minutes. queeze out the excess water. In a large bowl, combine potatoes, onion, flour, and eggs. Pat potato mixture into prepared baking dish/pan. Bake 15 minutes. Brush with 1 tablespoon olive oil and bake another 10 minutes. Place under broiler; broil 2 to 3 minutes or until golden crisp. Remove from oven and return oven temperature 425 degrees F.
Sources: I adapted this Vegetable Pizza with Potato Crust Recipe from the Better Homes and Garden magazine, November 2009. Photo also from Better Homes and Garden.